Here at ChiIL Mama and ChiIL Live Shows, every week is theatre week. We adore the Chicago scene, and review lots of shows year round. In fact, we're reviewing 6 this week. 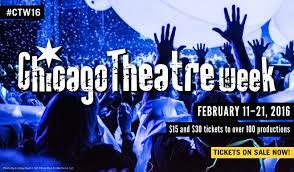 Chicago Theatre Week is your turn to attend shows like a critic without breaking the bank! Check back with ChiIL Mama (fam friendly) & ChiIL Live Shows (adult) frequently for our top picks, original reviews, and Chicago theatre news. Then get out and see a show... or two, or more. Chicago Theatre Week is an annual celebration of the rich tradition of theatre-going in Chicago, will take place February 11 – 21, 2016, spanning a week and two full weekends. Now in its fourth year, Chicago Theatre Week is a program of the League of Chicago Theatres in partnership with Choose Chicago. Tickets are $30, $15, or less and are on sale now. Advance tickets highly recommended as many productions sell out at these smokin' deals! A list of participating theatres is on ChicagoTheatreWeek.com. Over 100 participating shows and offer details are listed on the website, ChicagoTheatreWeek.com. 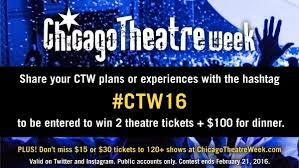 Follow @ChicagoPlays on Twitter for CTW announcements. In February 2015, 116 productions offered value-priced tickets for performances during Chicago Theatre Week. Almost 10,000 Chicago residents and visitors spanning 40 states attended a show during Chicago Theatre Week. This coming February, visitors and residents will again have the opportunity to sample the extraordinary range of theatrical offerings throughout Chicagoland. Chicago Theatre Week is presented by the League of Chicago Theatres in partnership with Choose Chicago along with support from Exelon. The lead hotel sponsor for 2016 is Sheraton Chicago – CTW hotel packages will be available both at the Sheraton Chicago and the dana hotel & spa. Chicago theatre is a leader in the U.S. with more than 250 theatres throughout Chicagoland, comprising a rich and varied community ranging from storefront, non-union theaters to the most renowned resident theatres in the country, including 5 that have been honored with Regional Tony Awards, and the largest touring Broadway organization in the nation. Chicago’s theatres serve 5 million audience members annually and have a combined budget of more than $250 million. Chicago produces and/or presents more world premieres annually than any other city in the nation. In the 2014-2015 season, Chicago theatre companies produced more than 100 world premiere productions and adaptations. Each year, Chicago theatres send new work to resident theatres across the country, to Broadway, and around the world. For a comprehensive list of Chicago productions, visit the League of Chicago Theatres website, www.chicagoplays.com. Half-price tickets are available year-round at www.hottix.org. Additional information about Chicago Theatre Week is available at www.chicagotheatreweek.com.